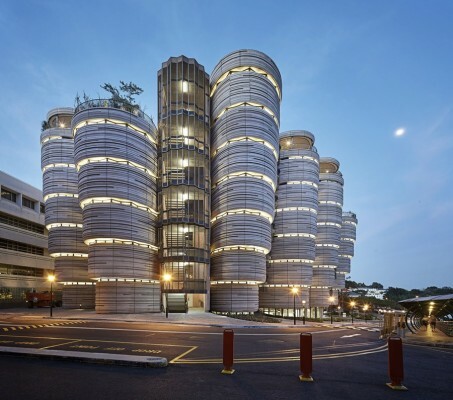 The Learning Hub at Nanyang Technological University (NTU Singapore), designed by Heatherwick Studio and executed by lead architect CPG Consultants, is a new educational landmark for Singapore. As part of NTU’s redevelopment plan for the campus, the Learning Hub is designed to be a new multi-use building for its 33,000 students. 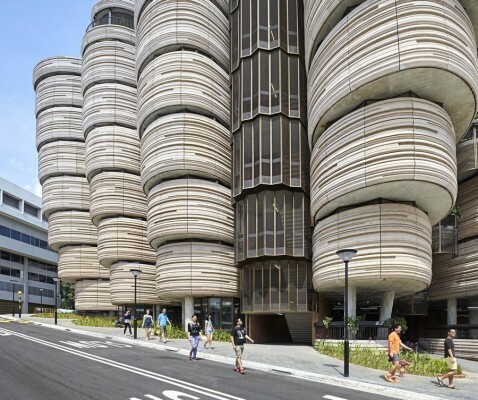 Instead of the traditional format of an educational building with miles of corridors linking box-like lecture rooms, the university asked for a unique design better suited to contemporary ways of learning. With the digital revolution allowing learning to take place almost anywhere, the most important function of this new university building was to be a place where students and professors from various disciplines could meet and interact with one other. 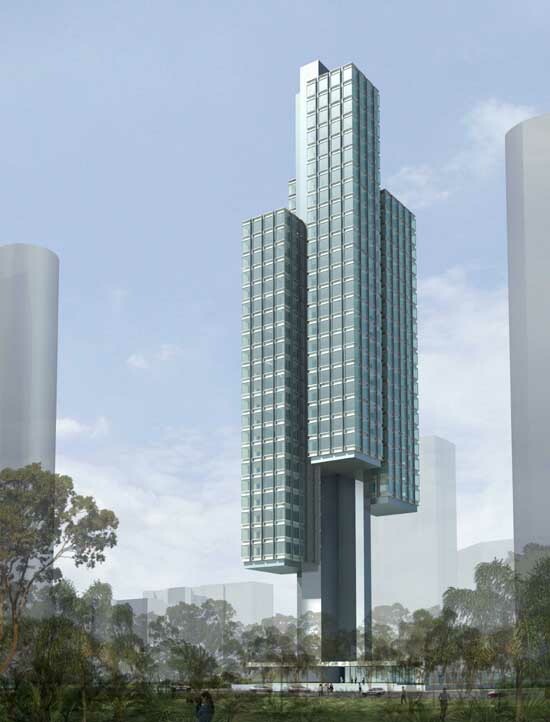 The Learning Hub is envisioned to be a place where students might meet their future business partner or someone they would have an amazing idea with. 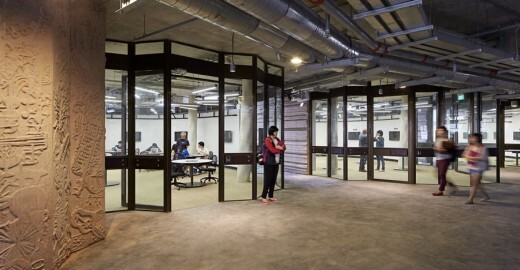 The outcome is a structure that interweaves both social and learning spaces to create a dynamic environment more conducive to casual and incidental interaction between students and professors. 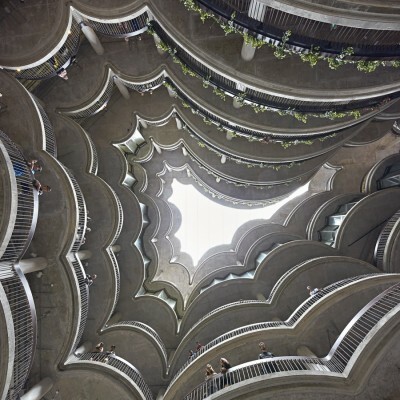 Twelve towers, each a stack of rounded tutorial rooms, taper inwards at their base around a generous public central atrium to provide fifty-six tutorial rooms without corners or obvious fronts or backs. The new-generation smart classrooms were conceived by NTU to support its new learning pedagogies that promote more interactive small group teaching and active learning. The flexible format of the rooms allows professors to configure them to better engage their students, and for students to more easily collaborate with each other. 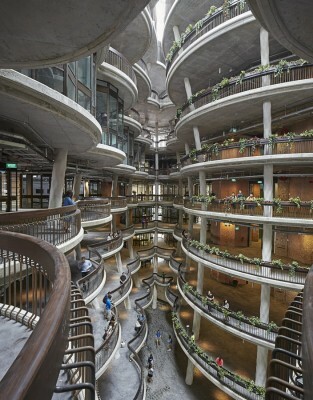 The rooms in turn open onto the shared circulation space around the atrium, interspersed with open spaces and informal garden terraces, allowing students to be visually connected while also leaving space to linger, gather and pause. 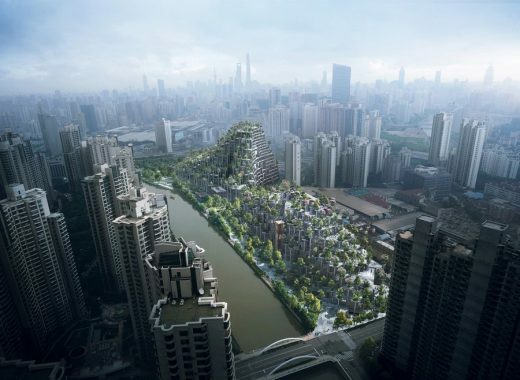 The combination of local building codes and high environmental aspirations meant that a concrete construction was necessary. The primary design challenge was how to make this humble material feel beautiful. As a result, the concrete stair and elevator cores have been embedded with 700 specially commissioned drawings, three-dimensionally cast into the concrete, referencing everything from science to art and literature. Overlapping images, specially commissioned from illustrator Sara Fanelli, are deliberately ambiguous thought triggers, designed to leave space for the imagination. 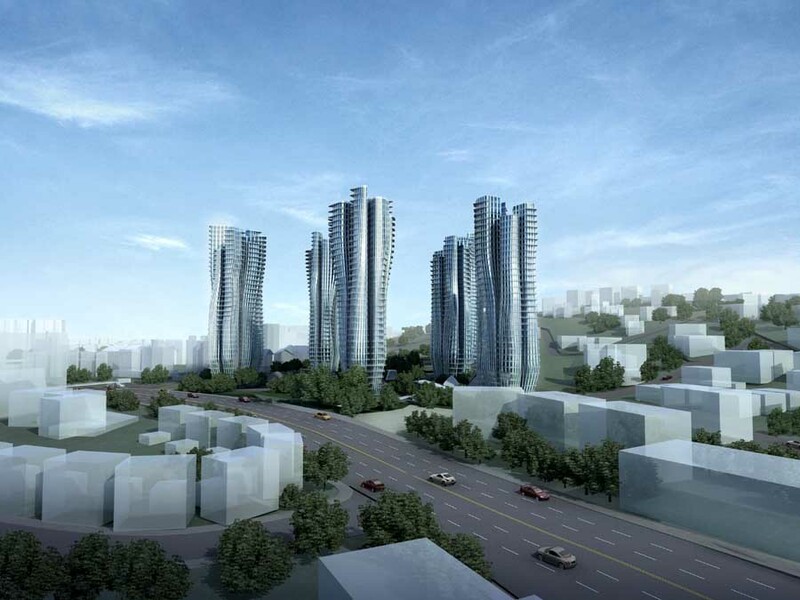 The sixty one angled concrete columns have a distinctive undulating texture developed specially for the project. 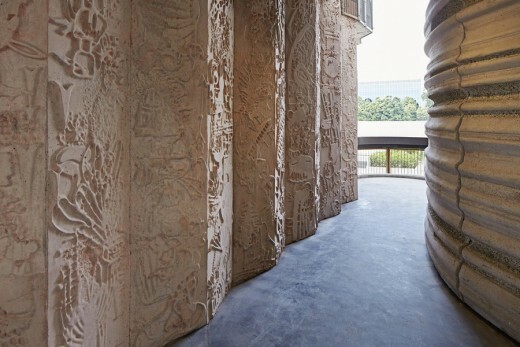 The curved facade panels are cast with a unique horizontal pattern, made with ten cost-efficient adjustable silicone moulds, to create a complex three-dimensional texture. 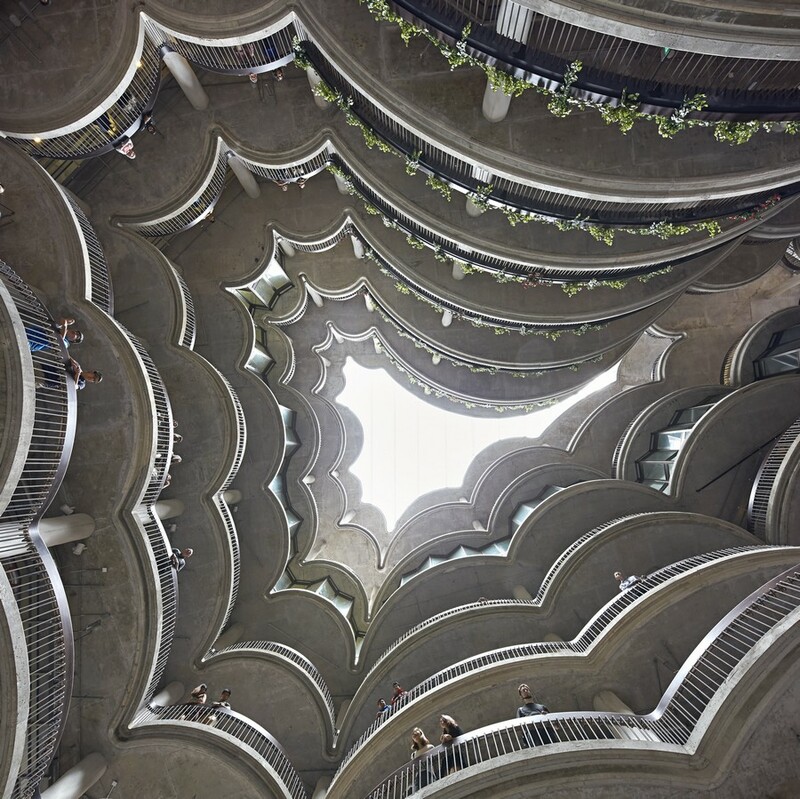 The result of the building’s various raw treatments of concrete is that the whole project appears to have been handmade from wet clay. 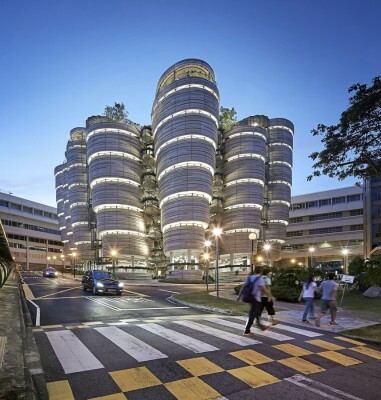 With year-round temperatures in Singapore between 25°C and 31°C it was important to maintain the students’ comfort whilst achieving a sustainable energy usage. The building’s open and permeable atrium is naturally ventilated, maximising air circulation around the towers of tutorial rooms and allowing students to feel as cool as possible. 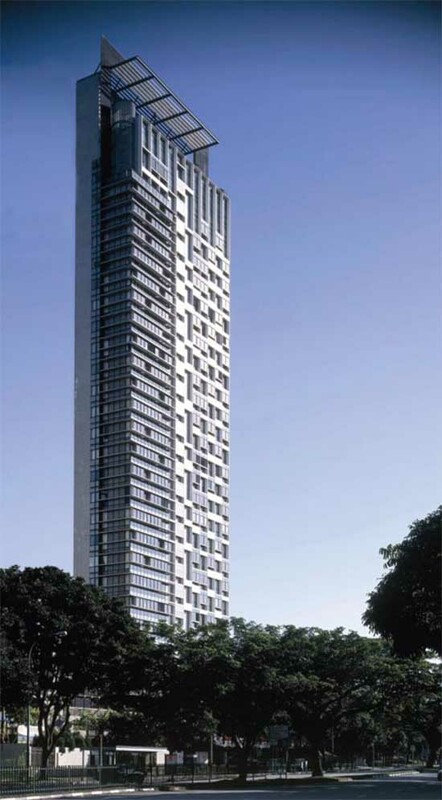 Each room is cooled using silent convection, which does away with the need for energy-heavy air conditioning fans. 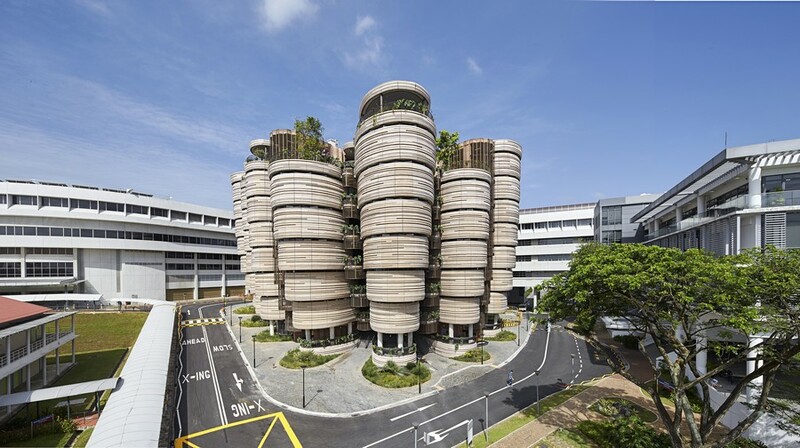 The Learning Hub building was awarded Green Mark Platinum status by the Building and Construction Authority (BCA), Singapore, the highest possible environmental standard for a building of this type. 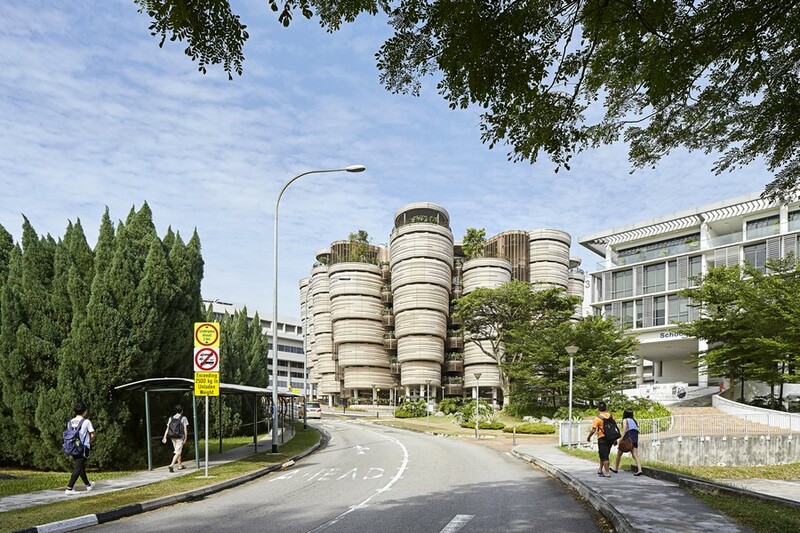 In a digital age when many students have multiple communication devices and ready access to knowledge, the Learning Hub reasserts the role of an educational building in the 21st century. 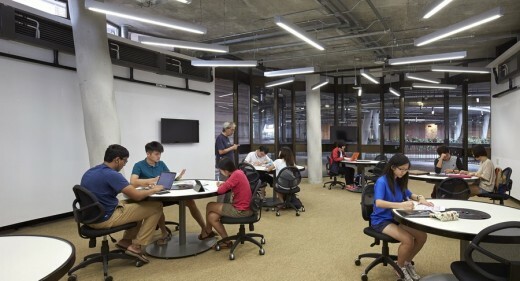 No longer a place for traditional lassroom teaching to passive students, NTU’s new icon provides space for collaborative learning in a technology-rich etting. Opened till late, it will be a place for students to gather, where knowledge is shared, collaboration between isciplines takes place and where future leaders are nurtured.